The bottom of this page gives complete directions on running this pool. If you're confused by the redrawing of numbers for each round, check out our normal March Madness Squares, where each person/square has the same two numbers for every game of the tournament. Check Out Our Scratch-Off March Madness Squares! Click the buttons below to randomly select your numbers. 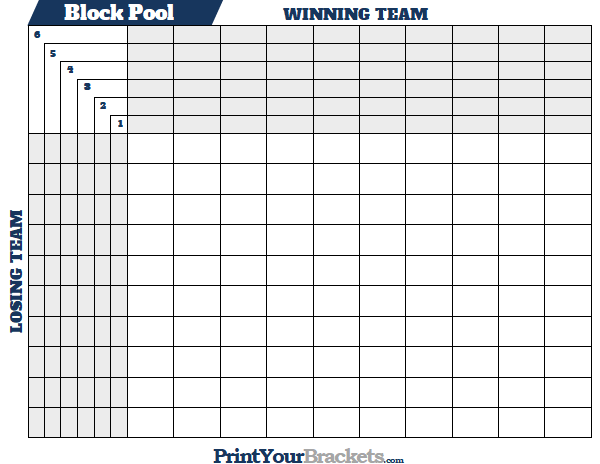 What is a March Madness Block Pool? If you've never ran this pool before, we highly recommend you give it try. Although the normal March Madness Bracket is the most popular office pool, this may be the best office pool you ever run! The idea is similar to your typical Super Bowl Squares pool, except there is a winning square for all 63 games of the tournament. We don't count the play-in games, but that is completely up to you. We also recommend trying our March Madness Props Pool, where you try to correctly guess 20 questions related to the outcome of the entire tournament. Print out the square grid from above and sell each of the 100 white squares for a set dollar amount until all squares are full, a player may buy as many squares as they wish. 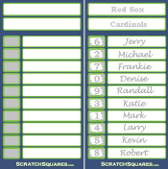 Once the player pays for the squares they are to write their name in the squares of their choice. The March Madness tournament has 6 rounds, therefore you will draw 6 different sets of numbers for both the winning team's squares and the losing team's squares. The number drawing can be done in many ways, listed below are 2 examples. Example 1: Write the numbers 0-9 on pieces of paper and place them in a hat. Example 2: Get a deck of cards Ace through 10, the ace represents a one, the 10 represents a 0, 2-9 are face value. After determining the drawing method, draw the numbers one at a time, placing the numbers from left to right starting with the first gray square box of the winning team, round 1 top row, continue across the top row until the numbers are gone. 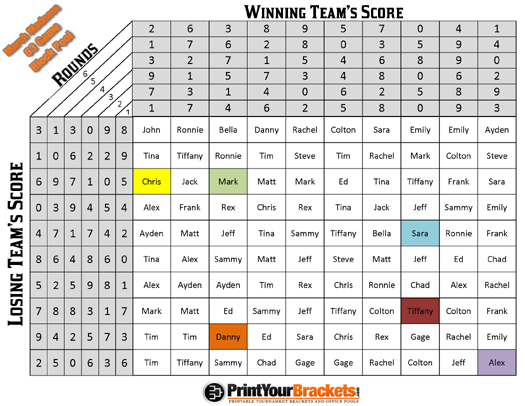 After that is complete you will redraw the numbers for the losing team round 1, this time placing the drawn numbers in the gray square boxes in the left column, starting at the top and going to the bottom until all ten numbers are gone. After that, follow the same steps for Rounds 2-6. Example 1:In Round 1 Ohio State beats Georgia by a score of 94 to 85. Go to the round 1 numbers find the number 4(last digit of 94) under the winning team's score then go to the round 1 numbers and find the number 5(last digit of 85)under the losing team's score. 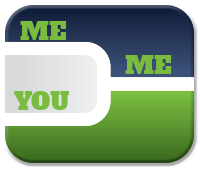 Find where these two numbers intersect and the winner is Mark(highlighted in green). You will do this for all 32 games in Round 1 of the tournament, which will give 32 winners for the round. Example 2:In Round 2 Duke beats Tennessee by a score of 99 to 93. Go to the round 2 numbers find the number 9(last digit of 99) under the winning team's score then go to the round 2 numbers and find the number 3(last digit of 93)under the losing team's score. Find where these two numbers intersect and the winner is Alex(highlighted in purple). You will do this for all 16 games in Round 2 of the tournament, which will give 16 winners for the round.. 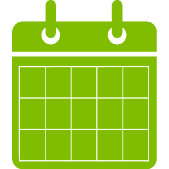 Example 3: In Round 3 Wake Forest beats Gonzaga by a score of 85 to 75. Go to the round 3 numbers find the number 5(last digit of 85) under the winning team's score then go to the round 3 numbers and find the number 5(last digit of 75)under the losing team's score. Find where these two numbers intersect and the winner is Danny(highlighted in orange). You will do this for all 8 games in Round 3 of the tournament, which will give 8 winners for the round. Example 4: In Round 4 North Carolina beats Duke by a score of 108 to 101. Go to the round 4 numbers find the number 8(last digit of 108) under the winning team's score then go to the round 4 numbers and find the number 1(last digit of 101)under the losing team's score. Find where these two numbers intersect and the winner is Sara(highlighted in blue). You will do this for all 4 games in Round 4 of the tournament, which will give 4 winners for the round. Example 5: In Round 5 Ohio State beats North Carolina by a score of 85 to 78. Go to the round 5numbers find the number 5(last digit of 85) under the winning team's score then go to the round 5 numbers and find the number 8(last digit of 78)under the losing team's score. Find where these two numbers intersect and the winner is Tiffany(highlighted in red). You will do this for both games in Round 5 of the tournament, which will give 2 winners for the round. Example 6: In Round 6(the championship game) Ohio State beats Kansas by a score of 82 to 76. Go to the round 6 numbers find the number 2(last digit of 82) under the winning team's score then go to the round 6 numbers and find the number 6(last digit of 76)under the losing team's score. Find where these two numbers intersect and the winner is Chris(highlighted in yellow). There will be only one winning square for the last round. 95 to 85, Mark would win all 32 games. For a total of 63 games/square winners. There winnings are usually paid in one of two ways. Payout Example 1: Each round's payout is a different dollar amount, increasing as the tournament progresses. If the squares were sold for $10 each that would be $1,000 in the prize pool. If squares are being sold for more or less, just multiply or divide the payouts accordingly. If each square was sold for only $5 just take the above payouts and divide them by 2. Payout Example 2: Take the total prize pool and divide it 63, each winning square would be paid the same amount. Again we will use the example that each square was sold for $10 , that would be $1,000 in the prize pool. 1,000 divided by 63 would be about $15.87 for each winning square. It's not likely that you are going to want to be paying out the .87 cents in change. So the best option would be to pay the first 62 games $15 each($930) and pay the winning square from the championship game $70. If you're selling the squares for an amount other than $10, you'll just have to do a little match to figure out your best payout options. When Does The March Madness Tournament Start? *Please check your local gambling laws for information on the legality of wagering money on office pools.